US oil production hit a record of 12.25 million barrels/day last month, overtaking Saudi Arabia as the world's largest oil producer. Canadian oil production reached 4.25 million barrels/day last month, also a record output, with nearly all the increase in production coming from the oil sands. The Americas (which include US, Canada and Mexico) produced a total of 20.5 million barrels of oil per day in June. Total demand in has remained steady in the past few years at about 24.2 million barrels/day. The United States and Canada still rely on imports from Latin America and the Middle-East (primarily the Persian Gulf, Saudi Arabia and Venezuela). But as North American oil supply approaches the demand curve, the need for export beyond Canada and the US grows more critical. Since Canada lacks the infrastructure to export crude and oil exports are banned in the US, the price discount between North American crude oil streams and world Brent crude is expected to widen as domestic production increases. US benchmark West Texas Intermediate (WTI) currently sells for $6/barrel less than Brent. The differential between Western Canadian Select (WCS) and Brent is almost $30/barrel. These discounts represent significant losses for the oil producers and less revenue for all levels of government. All of the growth in US production is in form of light or ultra-light tight oil, produced from the hydraulic fracturing of shale deposits. Since the Gulf Coast refineries are better suited to process heavy crude oil, light and ultra-light oil are a less desirable feedstock and therefore trades at a discount to WTI, currently about $10/barrel. American producers are therefore eager to export this light oil (or condensate) to Europe, where they can earn more favourable Brent crude prices. The US government recently granted export licences for the export of processed condensate from Texas' Eagle Ford shale formation. The United States is expected to ramp up light oil exports, up to 700,000 barrels/day next year and could potentially grow to 3 million barrels/day in the near future. The picture for Canadian oil is quite different. The Western Canada Select crude oil blend produced by the oil sands is highly desirable feedstock for Gulf Coast refineries which are specifically engineered for this heavier (and cheaper) crude. Since WCS trades at a significant discount to WTI (currently about 24$/barrel), sourcing the less expensive Canadian crude becomes very profitable for US refiners. The lack of port access in Canada therefore widens this Heavy Oil Discount much to the benefit of our neighbours to the south. 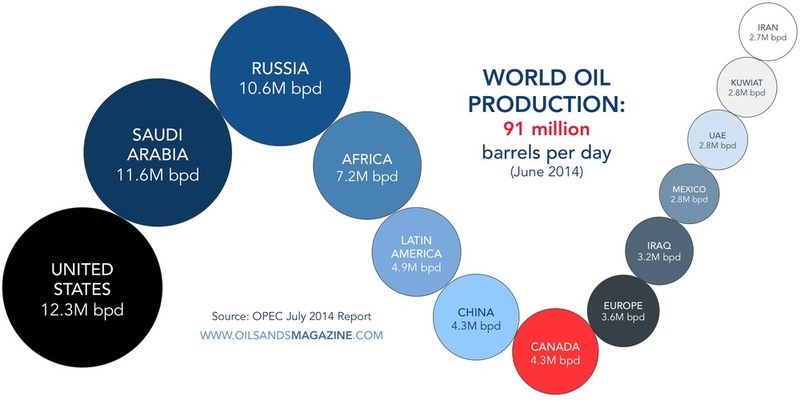 OPEC is projecting that US production will hit a record 13.5 million barrels/day by the end of 2015. Canadian oil production is expected to hit 4.66 million barrels/day by the end of next year. Undoubtedly, North America will need to export more oil overseas as domestic supply will eventually outstrip demand. The question is whether Canada will benefit by building the infrastructure to export their own oil or whether we'll continue to be America's lower cost oil supplier.